Get ready for what might be one of the biggest science stories of the century. 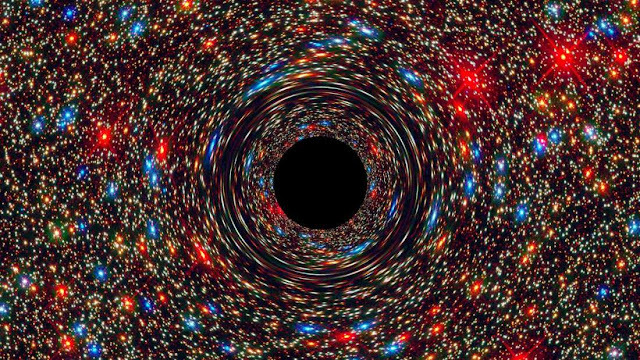 It looks like astronomers may be about to reveal the first-ever image of a black hole. The Event Horizon Telescope (EHT) project is taking part in numerous pressconferences around the world on April 10 to make a big announcement about “a groundbreaking result”. They’re keeping schtum about any details, however, it’s fairly certain they will reveal the first results of their mission to take an image of a black hole’s event horizon, providing an unprecedented insight into one of the most mind-blowing phenomena in the universe. A black hole is a portion of spacetime with such strong gravitational effects that nothing – not even light – can escape its grasp. This means it’s not possible to capture a direct image of a black hole, as they are totally absent of visible light by their very nature. They also engulf all other forms of electromagnetic radiation, which means you can’t observe them using radio waves, X-rays, gamma rays, or any other type of nifty telescope. We can, however, observe their event horizon, a black hole’s “point of no return” beyond which nothing can escape. Therefore, the image will effectively be a "silhouette" of a black hole. The Event Horizon Telescope project consists of a global network of radio telescopes dotted around the planet with their eyes peeled on Sagittarius A*, a supermassive black hole at the center of the Milky Way, and the black hole in the giant elliptical galaxy M87. By compiling all of their data, they are able to create a "virtual" telescope with an effective diameter of the whole planet. "The Event Horizon Telescope (EHT) collects light from the black hole using a small number of telescopes distributed around the Earth. Once the EHT has measured data from the black hole, we still need to make a picture from it – a process referred to as imaging," the EHT project explains on its website. "The light we collect gives us some indication of the structure of the black hole. However, since we are only collecting light at a few telescope locations, we are still missing some information about the black hole’s image. The imaging algorithms we develop fill in the gaps of data we are missing in order to reconstruct a picture of the black hole." Considering how high-profile the announcement is, there's a possibility this could be a “mission accomplished” moment. So, grab some popcorn and be prepared for Wednesday, April 10, 2019, 1pm UTC (3pm CEST, 9am ET, 6am PT). The event will be live streamed on the ESO website, by the European Research Council YouTube channel, and on social media.